Here it is! See how the edge is clear and the frit made little brown speckles everywhere? I think this dish would look great with my homemade soap in it. What do you think? I would like to thank Melsie Glass for hosting me and giving me so much information about fusing glass. It was great fun! 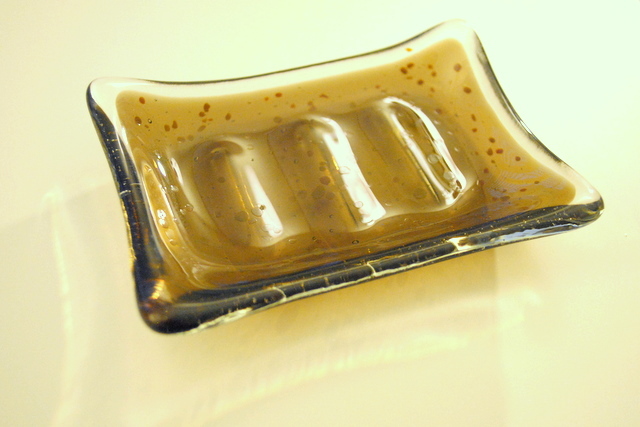 – On the one hand, making fused glass seems pretty simple. You cut glass pieces, lay them out, and fire them. – On the other hand there is a lot of science behind doing it well, I think. There are chemical reactions between glass colors, firing temperatures and lengths of time, and more that I probably don’t even know about. – But wow, look at the finished pieces you can make! Talk about impressive. If you’re not local check a glass store or an arts center near you. Enjoy! That is awesome! Looks like fun too. Hi, quick question. Do you perhaps have the supplier name for the ceramic soap dish mold?